Right now, as I kick off my blog, there’s only one burning question on everyone’s mind. ‘What’s so special about Pune that’s got me, the very picky Czarina, to move residence, Louis Vuitton bags, Jimmy Choo shoes, Jag and her fashion business to the city of pensioners! She’s lost her marbles, declared my exasperated gal gang, the others began speculating if I was in love! In love with wanting to lead my life my way, on my own terms, push the boundaries on lifestyle experiences, enhance the extraordinary and step away from the mundane and predictable especially in the way one lives. 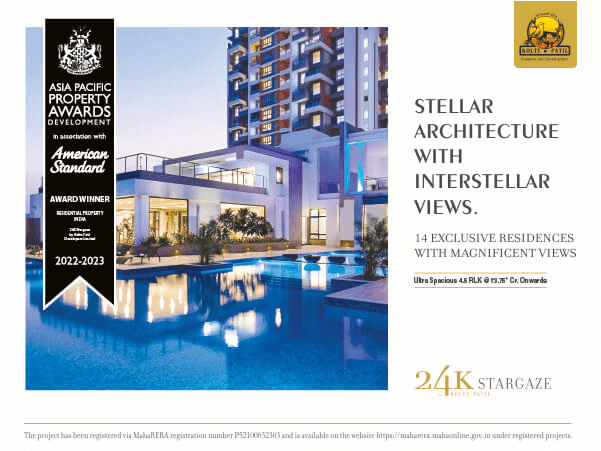 So, a few months ago when one of my dearest friends, the famous Miss Malini none the less, told me about her exciting brand association with the ultra-premium 24K residential project by the renowned Kolte Patil developers who have built an impressive real estate portfolio over 25 years, my ears perked up. Inspired by the motto of ‘Creation not Construction’, Kolte Patil Developers have changed the urban landscape in Pune, Bengaluru and Mumbai by leaving their indelible mark of undeniable excellence, flawless architectural designs and world class construction to create lifestyle living spaces that are worthy of discerning clients who embrace high octane change. And I was looking for change. Looking to get away from the mindless hustle and bustle of the big city and discover serenity, while pursuing my ambitions. Champagne and caviar instantly forgotten, I sat spellbound as Malini told me all about 24K and their lavish, sophisticated, luxurious apartment projects built based on the legendary Le Corbusier’s Golden Ratio Philosophy. Now that’s what I call mindful futuristic architecture folks! Now I can’t wait to move into my 24K Opula apartment. Can’t wait to feel the fresh morning breeze float across the lush landscape, hear the birds chirping, enjoy my coffee and morning read on my trendy sundeck, energize and get ready for the wonderful days ahead.